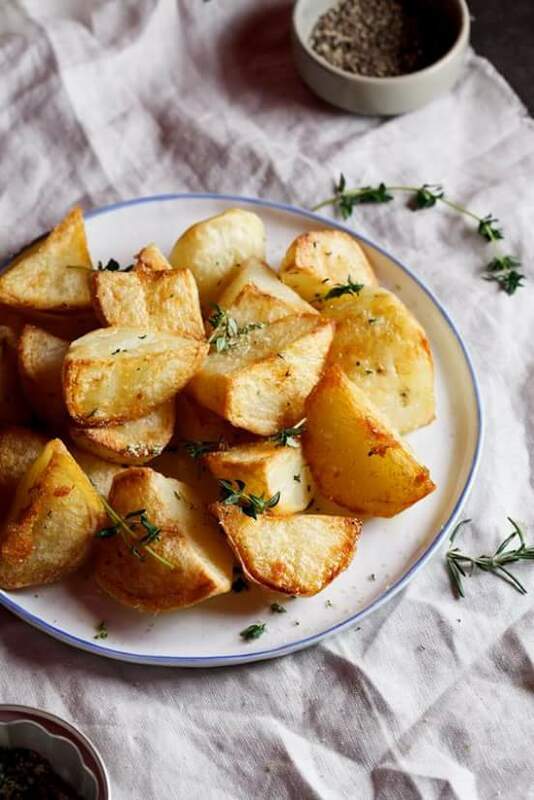 The herb salt adds a touch of luxury to this roast potato recipe. Pre-heat the oven to 200°c. Halve the peeled potatoes then cut each half in ⅔ pieces. Put the potatoes into a large pot and add water. In the meantime, heat the oil in a large roasting tray. When the oil is hot and the potatoes are dry, carefully place the potatoes in the oil and place in the oven. Allow roasting for 30 minutes. In the meantime, blitz the salt and herbs in a food processor. When the potatoes have been roasting for 15 minutes, remove from the oven and sprinkle over the salt. Toss to coat the potatoes in the salt and oil then place back in the oven and allow to continue roasting. Remove the potatoes when they are golden and crunchy and serve immediately.